Can Dubai Safari be like a real African Safari? This summer, Dubai will see the launch of a new zoo with a Safari Park. The Safari Park covers an area of 119 hectares and has been built for an estimated $40 million. The zoo will house a thousand animals from around the world, of which 350 animals are rare and endangered species. This new zoo will replace the zoo on Jumeirah Road, which was built on 1.5 hectares. The park has been under construction for almost a decade and the animals have finally adapted to their new habitat. Officials at the Dubai Municipality claim the zoo has been built with an innovative design and layout using renowned methods of other safaris and zoos. Not only is the park designed to outstand other safaris from around the world, but also made according to the needs of Dubai. Going on a real African Safari will give you a chance to get out of the hustle and bustle of the city, while the Dubai Safari is right in the midst of the city. When you are in Tanzania, you will get a taste of nature firsthand and nothing can be better for recharging your batteries. When you visit the Serengeti, you get to see animals in their actual habitats, not the man-made cages of Dubai Safari. You will be in a 4×4 vehicle as the animals are roaming around freely or falling asleep to the sounds of nature. But don’t worry about safety, because your vehicle will be protected with glass. An authentic Tanzanian safari will allow you to glimpse rare animals as you immerse yourself into the wonderfulness that is Africa. As mentioned above, the Dubai scenery is being created out of false greenery and waterfalls. However, in Africa, there is no need to create anything because the wonders of nature are already there. The view is spectacular, with the Serengeti in front of you, with snowcapped mountains in the back. You will get amazing photographic opportunities where you can create lasting memories of the place, the people and the amazing wilderness. The entire safari experience in Tanzania is guided by professionals who know exactly what they are doing and where to go, which means you can make the most of your time in Africa. You won’t have to worry about getting lost and you will be thoroughly briefed about the wildlife you are viewing. A similar knowledgeable and adventurous experience is unfounded in a Safari park, such as in Dubai. In Africa, you will get a deeper understanding of the African culture with impeccable insight into the movement and behavior of the wild African animals. 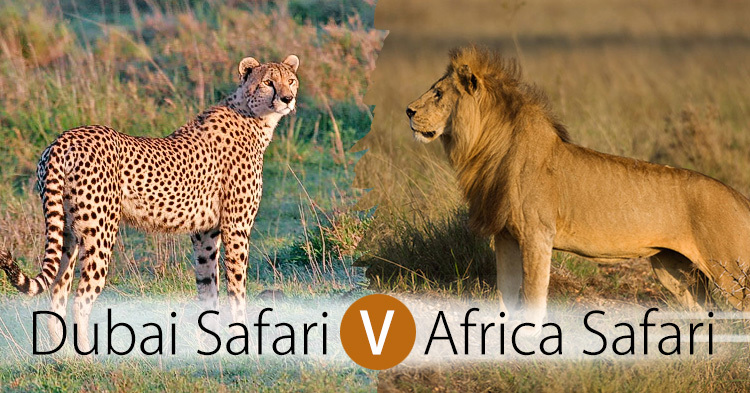 There is only a small slice of nature left on Earth and by taking an African safari you will essentially support nature conservation and wildlife rehabilitation. The money you spend on the safari is used towards protecting and preserving the wilderness areas. Most of the accommodation at the safari is created to environmentally support the well-being of the African wildlife. The money spent at a Dubai safari won’t be used towards preservation of nature.